Discussion in 'Electric Instruments' started by leokula, Mar 12, 2018. I've been searching the internet (as well as the forums) to find out more about the history of the PRS Santana body shape, but haven't had any luck. Does anybody have any info on this? I know it's very similar to the les paul double cut, but is this it? And if so, why? Is this what Santana was playing at the time? I’ve always thought of it as a nod to the SG that Carlos previously played but will defer to those who know more. Killer guitar, whatever the origin! I think it is because some of the earliest guitars PRS made and got into the hands of Carlos already had this LP Junior type shape. Add a carved maple top and a trem, and it was a totally new guitar, and unlike anything else at the time. My 2003 Santana II is my favorite PRS. I love the large neck carve, Brazilian fretboard, clear and chimey tones. The body shape and top carve make it the most ergonomic PRS for me. Alnus Rubra, leokula, grausch and 1 other person like this. By the late '70s, Carlos Santana had met Paul Reed Smith and begun using one of the original PRS guitars. It wasn't until about 20 years later, however, that the two teamed up to design, build and sell the PRS Santana model guitars. Why did it take so long? One reason may have been that Carlos had no way of knowing that he'd be playing these guitars for over four decades, with no end in sight. Also, once he and Paul Reed Smith had made the decision to create a signature Santana model, it could have taken a very long time to lock in all the specs.. High-profile artists are generally very careful when attaching their names to products, and their exacting wishes must be balanced with instruments that can be reasonably built and afforded by other players. However the process began, it culminated in the mid '90s, with the guitar originally called simply the Paul Reed Smith Santana Signature guitar. Eventually, in order to distinguish it from later models, it became known as the PRS Santana I model. I think Santana 1st started playing a PRS after he started playing with John McLaughlin (who played one, and still does at the age of 76) ..
Tramp, grausch and Alnus Rubra like this. I only have one PRS which is a 2011 SE Santana, it is indeed my favorite shape that PRS does. Seems like there's indeed not much about the body specifically, couldn't find any quote by Paul whatsoever. So old PRS's were mostly this body type? The custom 24 and mccarty came afterwards? is that yours in the pic ??? .. beautiful ..
the only thing I didn't like was the location of your volume control being so far ..
single soapbar pickup in the bridge position, and volume control only ..
the peace sign inlay on the fret board is pretty cool ..
dogrocketp and grausch like this. That was the main shape Paul was building in the early days. I don't remember exactly when Paul and Carlos met, but it was likely before the classic PRS silhouette was born. leokula and sergiodeblanc like this. Yes, that one is mine. Vintage Yellow with the traditional cherry back. Love it! Can somebody describe specifically what makes this model a favorite (ergonomic-wise)? 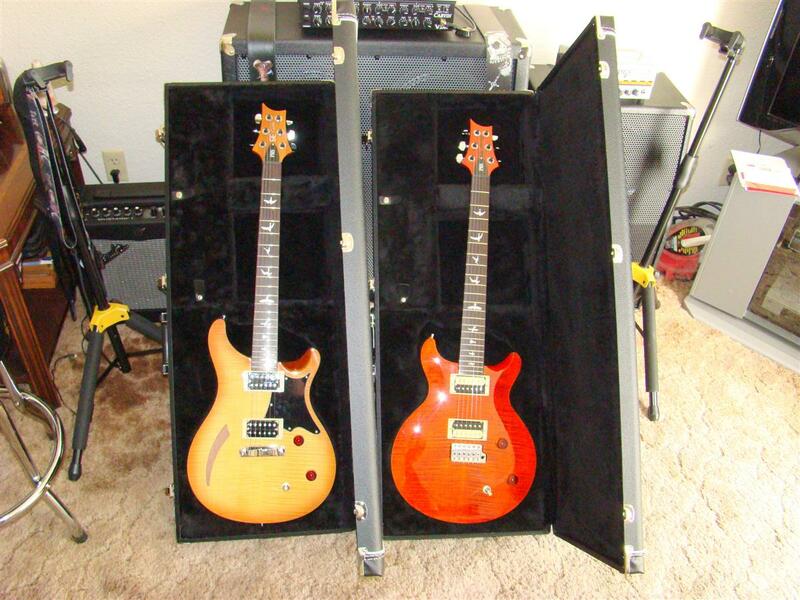 It seems like the body is wider...therefore all other PRS models are smaller? I have the other typical PRS shaped guitars (i.e. Custom) so I'm trying to compare the Santana shape to those. I have yet to find one in the wild so I cant try it for myself. It isn't wider, but the lower bout is more round and the bass side horn on the upper bout is shorter than the more typical PRS shape. dogrocketp, leokula and grausch like this. Cool! Its actually 'smaller' near the neck pickup. I hadnt realized that. For some reason, I always thought the Santana was this HUGE shape. The photo comparison clears it up. Thanks! No prob! It actually looks a little small and stumpy hanging on a wall of guitars that have the other body shape. I would like to help, however I am not sure I can. Having a Santana core model and a Paul's Guitar gives me the chance to provide a quick answer: I like both. They are simply great and are a joy to play. However, I will always like -a bit- more the Santana model. Maybe the neck is a little rounder, maybe the 24 frets give few more options, maybe the shape is the best for my eyes, maybe this or that.. Regarding the body width, there is no difference between the guitars while playing. I would pick a Santana model (sold two custom shop from another brand and I never looked back for them after I got the Santana) if I had to have one guitar - but again: This is a very personal thing. I wish you good luck with finding one and trying it out. Casi1, dogrocketp and sergiodeblanc like this. Preach! I like the body shape. I love the knob position....out of the way if you ride 10! Big beefy neck. Glorious tonez! Short scale and blazing fast. Just. Pure. Joy. Everyone should have at least one! veinbuster and sergiodeblanc like this. I've always assumed it would hang like a boat anchor on me the way a Les Paul does, given that it has so much of its mass in the lower bout. Love the neck on it. the big shape without getting in the way, and the fretboard radius is higher/flatter. Sitting down the upper horn doesn't let you slouch and rest on it as easily as the on the Custom shape. Despite slightly larger body bout, it's not heavy. Hangs nicely. The headstock is way cool and petite. comes with an eagle too. bodia and Casi1 like this. It's the original shape Paul made for Howard Leese. Paul liked mahogany bodies and 50s Juniors. He made a similar shape for Peter Frampton, but different headstock. 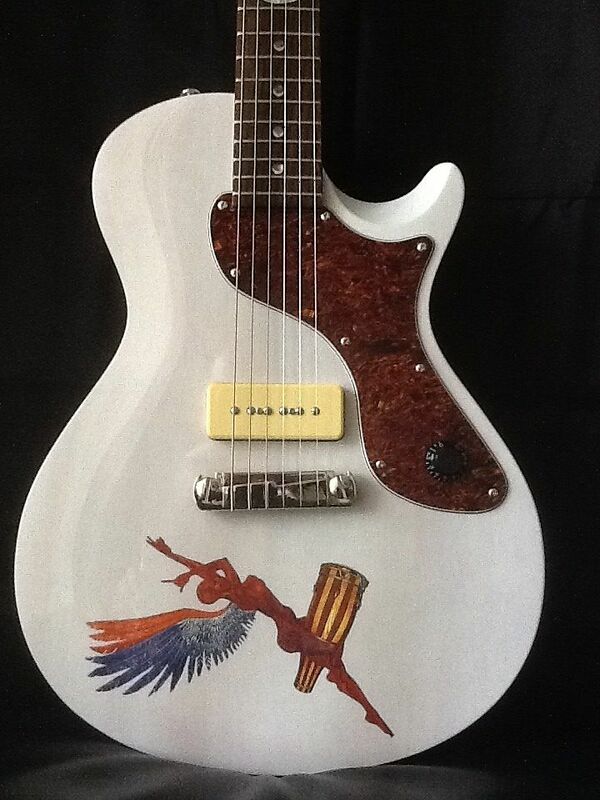 Santana picked out the shape from Paul's scrap book seeing Howard Leese's guitar.